Suppression of CD105 (endoglin) increased cell apoptosis under hypoxic stress in the absence of TGFbeta1. The data suggest that adenosine plays a major role in the induction of Tr1 cells, which also utilize adenosine to mediate suppression in the tumor microenvironment. Apoptosis is a process characterized by a very well defined series of morphological and biochemical hallmarks; it was originally defined as a form of cell death independent from pathological insults but now has been associated to many neurodegenerative diseases. 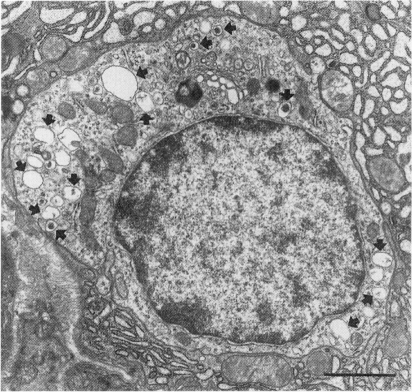 Apoptosis shows typical ultrastructural features. A first series of alterations occurs at nuclear level with chromatin condensation and segregation into sharply delineated very dense masses that about on the nuclear envelope and nuclear pyknosis. Then cytoplasm is affected with condensation and vacuolization. 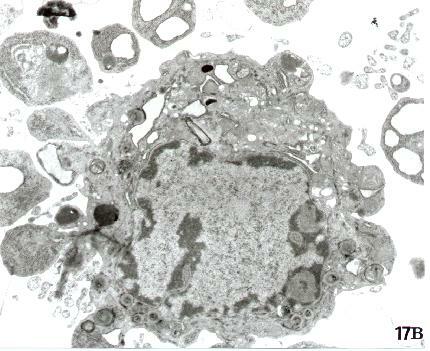 Eventually the entire cell shows convolution of its membrane with an irregular cell outline and shape, shrinkage, abnormal packaging of intact organelles in cytoplasm, nuclear budding and fragmentation in the presence of an intact nuclear envelope. The last step in the apoptotic process is then cell fragmentation into membrane-bounded apoptotic bodies with well preserved organelles. These morphological changes are largely the result of activation of a set of “cell-suicide” cysteine proteases, the caspases. The process of apoptosis is controlled by a diverse range of cell signals, which may originate either extracellularly (extrinsic inducers) or intracellularly (intrinsic inducers). Extracellular signals may include toxins,hormones, growth factors, nitric oxide or cytokines. An example of extracellular signal is the Fas ligand (Fas L) which binds the Fas receptor (also known as Apo-1 or CD95), a transmembrane protein part of the TNF family. The interaction between Fas and FasL results in the formation of the death-inducing signaling complex (DISC), which contains the FADD. Fas-Associated protein with Death Domain (FADD) is an adaptor molecule that bridges the Fas-receptor, and other molecules to form the death-inducing signaling complex (DISC) which activate caspase-8. A cell initiates intracellular apoptotic signaling in response to a stress, which may bring about cell suicide. The binding of nuclear receptors by glucocorticoids, heat, radiation, nutrient deprivation, viral infection, hypoxia and increased intracellular calcium concentration. The first intrinsic pathway to be discovered starts in mitochondria. Stimuli acting along this pathway cause changes in the inner mitochondrial membrane with a consequent opening of the mitochondrial permeability transition (MPT) pore, loss of the mitochondrial transmembrane potential and release into the cytosol of two main groups of pro-apoptotic proteins that are normally sequestrated within the intermembrane mitochondrial space . The first group of these proteins consist of cytochrome c, Smac/DIABLO, and the serine-protease HtrA2/Omi. The DISC complex and the Apoptosome bind and activate the effector caspases as caspase 3. Inhibitor of apoptosis proteins: translating basic knowledge into clinical practice..